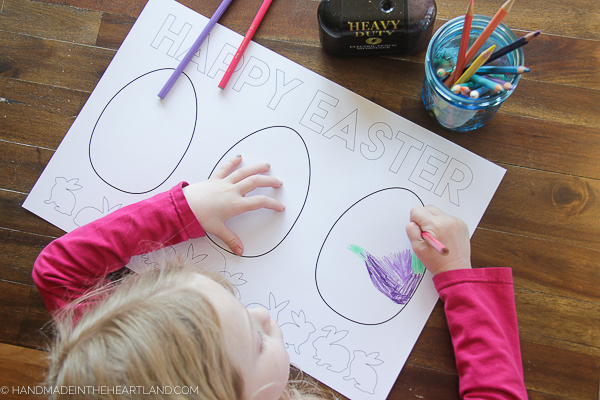 Print out this fun Easter egg coloring page placemat for your kids this Easter! It’s the perfect way to keep them busy while you get a festive meal prepared! Easter is this Sunday and I’m happy to share this fun free printable placemat coloring page with you! My kids love to color and this large scale placemat style is perfect to keep them busy on Easter Sunday. I decided to leave the Easter eggs blank to encourage the kiddos to decorate them however their imagination sees fit. 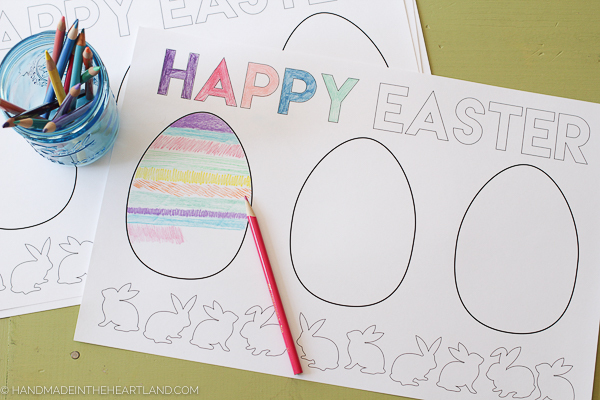 You can download this fun Easter color page placemat for kids HERE. If you use it please let me know! It thrills me to see you using ideas from the blog! I’d love to see a picture of your kiddos coloring it or a finished coloring page! Leave a comment or tag me on Instagram (@handmadeintheheartland) or facebook!